Running a lot can really take a toll on your body if you have issues with moderation. I’ve been itching to start ramping up running mileage but do not want to do it while I still have unresolved issues. Knees have suffered but I am now incorporating (as prescribed after much research and a visit to my orthopedic doctor and physical therapist) LOTS of single leg squats at a very slight decline (like 5 sets of 20 for each leg before a strength workout). Apparently, the eccentric component of this exercise stresses the patellar tendon enough to increase blood flow which in turn jump starts more effective healing. So far, it’s sort of been miraculous. I haven’t taped up my knees for the running that I am doing and they are not as sore, if at all. After I ran a 50k in October, I was too eager to get back into training and after a quick run felt a twinge and tightness in what appears to be my left gluteus minimus (though I keep 2nd guessing that it may be a strained tfl). The problem manifests itself as tightness near the insertion point to my upper pelvic crest. Nevertheless, it is for this reason that I am not wholeheartedly ramping up the miles. So, scaled back miles, icing after diminished runs, rolling around on the foam roller, and strength training to support running are what I’ve been doing lately so that when I can ramp up, everything is functional and strong. Here is one particularly tough strength workout I’ve been incorporating into my week 2 times (once the day after my long run to get that back to back action) to make up for less mileage. It was inspired by Dr. Metzl’s workout for runners but I’ve modified it to help sort out my own issues. As a side note, I do it fasted (though I do have water and electrolytes). It’s not easy. This entry was posted in Fueling, injury and training, strength training for runners and tagged 50K, eccentric exercise, fat-adapted training, Jordan Metzl, Metzl, running, single leg squat, strength training for runners, strength workout on December 15, 2014 by Leo Garcia. Over the last 4 days my legs have been very sore. I’ve been walking down stairs backwards, using my arms to prop myself up, and stretching the muscles of my legs a bit more each day. On the advice of my long time friend, Western States finisher, Rolfer, and go to guy for fixing my legs, Art Riggs, I’ve been walking and this morning placed my bike on the trainer and went for an hour. Things are starting to feel normal again. The physical idleness has not kept me from thinking about the American River 50M ultramarathon in April, how the next training cycle will look, and, of course, what I could improve both in training and on race day. I’m still interested in existing on that fine line between keeping my body from falling apart and training intensely enough to perhaps reach a higher personal peak in physical performance. So, how am I going to adapt/evolve for the next training cycle? First, I am pretty sure my diet is going to stay close to Ben Greenfield’s Low Carbohydrate Diet for Traitheles and Vespa’s OFM protocol. Second, I am going to incorporate more speed work, cross-training, hiking with a weighted vest, and trail running into the fold. While I did do some cross-training in the form of strength and HIIT, I did not do speed work or too much trail running in my last cycle. And, third, in addition to doing a lot of fasted runs, I am going to “practice” different nutritional approaches during the long ones (16-30 milers): one where I am fueling with UCAN Super Starch, one where I am using Tailwind’s carbohydrate/electrolyte drink, and one where I am eating real food – nuts, bananas, chia, coconut oil, potato, etc… as I prepare for the 50 miler. I’d like to see what life without gels is like and how slow a trickle of carbohydrate intake keeps the fat burning and the energy constant. Next Post: 50M Training Schedule. 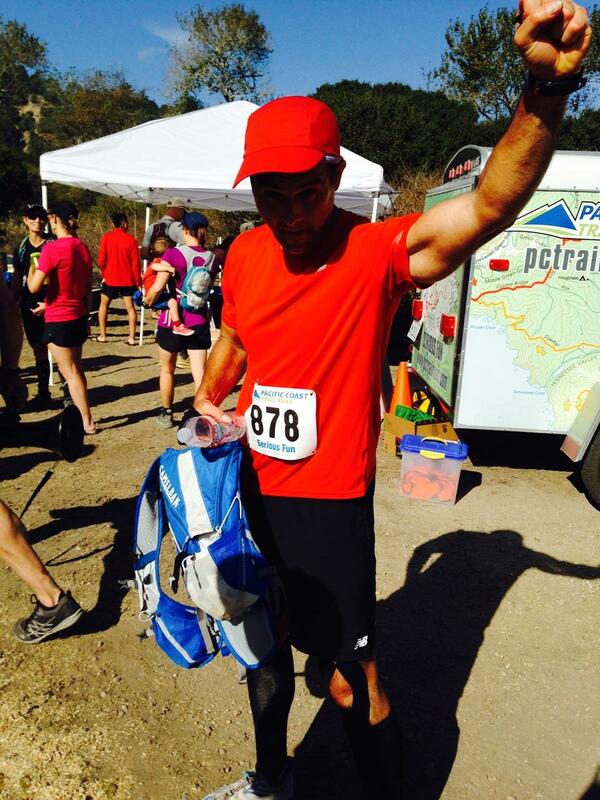 This entry was posted in 50K, 50M, American River 50M, Art Riggs, Ben Greenfield, Fat for Fuel, Running, Tailwind, Training, UCAN, UCAN Super Starch, ultramarathon, Vespa, Western States and tagged 50K, American River 50M, Ben Greenfield, endurance training, fueling plan, OFM, superior performance, Tailwind, UCAN, ultramarathon, Vespa on October 21, 2014 by Leo Garcia.